When I first started writing this blog I was writing about daily skin care routine and products that I use on a regular basis. But when I started explaining why wearing SPF cream is extremely important, I realized that there is an important piece of information missing. Cleanse, tone and moisturize is important, of course. But knowing what skin cancer is and what can you do to prevent it is way more important. Most skin cancers arise from DNA mutations induced by ultraviolet light affecting cells of the epidermis. Did you know that Skin Cancer is the most common cancer in the United States? According to American Academy of Dermatology it is estimated that approximately 9,500 people in the U.S are diagnosed with skin cancer EVERY. SINGLE. DAY. People need to see those numbers to realize the importance of paying attention to new lesions on the skin (also known as moles), wearing sunscreen and getting a skin examination by dermatologists. Everybody should know by now that you should avoid a sun exposure from 9 am to 3 pm, wear sunglasses, cover moles and apply sunscreen to your face and body all year long! UV is not your friend and being under the sun a lot and using tanning beds increase the risk of skin cancer. What are the risk factors for skin cancer? Ultraviolet light exposure, either directly from the sun or from tanning beds. Fair-skinned individuals, with hazel or blue eyes, and people with blond or red hair are particularly vulnerable. A chronically suppressed immune system (immunosuppression) from underlying diseases such as HIV/AIDS infection or cancer or from some medications such as prednisone or chemotherapy. Exposure to ionizing radiation (X-rays) or chemicals known to predispose to cancer such as arsenic. People who have a history of one skin cancer have a 20% chance of developing a second skin cancer in the next two years. Elderly patients have more skin cancers. A white, yellow, or waxy area with a poorly defined border that may resemble a scar. What about moles? When are they dangerous? 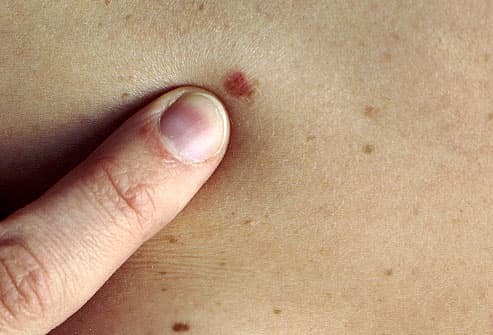 Moles are almost always harmless and only very rarely turn into skin cancer. Everyone is encouraged to perform regular skin self-exams to check for signs of skin cancer as skin cancer can be cured if it’s found and treated early. If you notice any spots on your skin that are different from the others, or anything changing, itching or bleeding, the American Academy of Dermatology recommends that you make an appointment with a board-certified dermatologist.